Customers in Mitchells & Butlers pubs will be able to satisfy their cravings for chocolate and beer in one easy serve, as Montezuma’s Chocolate Lager from Hogs Back Brewery goes into keg format in time for the three key chocolate occasions of Valentine’s, Mothers’ Day and Easter. Montezuma’s is the world’s first authentic chocolate lager, launched in 2014 by Hogs Back Brewery in collaboration with Montezuma’s Chocolate. Mitchells & Butlers will be the first operator to take the beer in keg, putting in on the bar in around 110 of their ‘Castle’ concept pubs. A 4.5% ABV light, refreshing beer with a well-balanced chocolate and hop flavour, Montezuma’s won a Gold award at the International Beer Challenge 2014. It was developed by Hogs Back Brewery with Montezuma’s Chocolate, based in Sussex, using a natural essence from their ‘Lordy Lord’ dark chocolate bar. 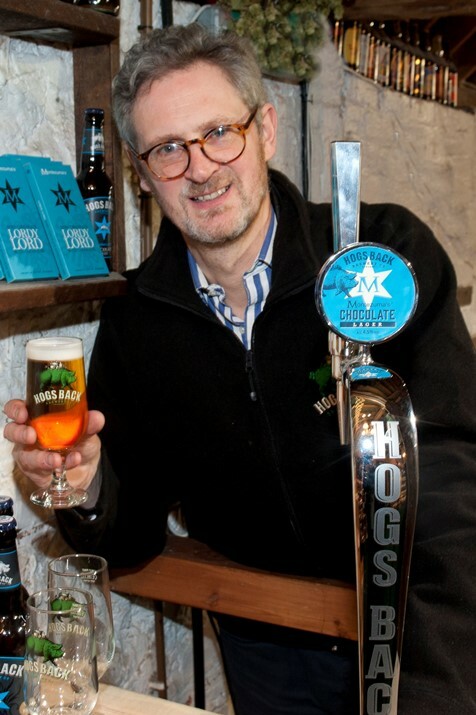 The lager itself is based on the recipe for Hogs Back’s Hogstar English Lager, which is brewed with five different hops and special botanicals, and is matured for over a month to allow flavours to deepen. Bestway Wholesale, the UK’s leading independent wholesaler, is expanding its wine offer with new lines designed to help on-trade operators capitalise on consumer trends. Wine sales in the on-trade are valued at £3.9bn by the IWSR, with wine accounting for almost 20% of the value of drinks bought when consumers are out in pubs, bars and restaurants. Helping operators maximise the opportunity, Bestway’s new additions are Royal Prosecco, Villa Principal Rioja Tempranillo and two ranges: the Toro Riendo own label ‘everyday’ Spanish wines and the Cellier D’Or range of French wines, which will be sold exclusively by Bestway in the UK. Prosecco overtook Champagne as the UK’s favourite sparkling wine last year. Roopinder Toor, Bestway licensed category controller, said “We have seen triple digit growth in Prosecco sales at Bestway over the last year, and are delighted to be bringing Royal Prosecco to market. Spanish wine sales have grown across the board, with Rioja achieving a 10% increase last year. A third of all wines from the Rioja region are exported to the UK. With the growth of Rioja, consumers are exploring the wider Spanish wine offer – a trend which the Toro Riendo range of everyday wines caters for with its five variants: dry, medium and sweet whites, a medium bodied red and a medium dry rosé. Finally, completing the new line up is an exclusive label from France, Cellier D’Or, which comprises red, white and rosé variants. Royal Prosecco and Villa Principal Rioja Tempranillo will be promoted in Bestway and Batleys depots throughout February with a discounted case price of £29.99 and £24.99 respectively, and will also be available for free delivery. Bestway offers its customers a range of added value services to help them grow their wine business, including: wine list advice and printing, and guidance on selecting wines to match food menus. Fireball has launched a campaign to get the weekend off to a scorching start with the chance for consumers to win prizes every Fireball Friday. The fast-growing cinnamon liqueur is inviting consumers to post Instagram pictures showing how they enjoy Fireball on a Friday. 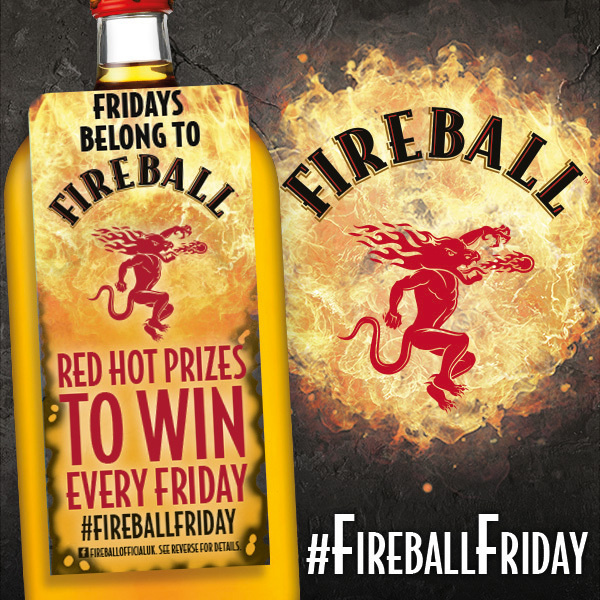 By following FireballUK on Instagram and using the hashtag #FireballFriday, consumers are entered into a digital raffle. Weekly prizes will include iPods, festival tickets, headphones, speakers, and other giveaways, with a winner selected every Friday until April 2016. Figures for global spirit sales collated by IWSR show that Fireball is the world’s fastest growing liqueur brand, and it is now ranked at number 10 in IWSR World Class Brands listings, based on international sales volumes. The ranking reflects global growth for Fireball from just over 2m cases in 2013, to more than 4.2m cases in 2014. For more information, contact Hi-Spirits on 01932 252 100, email info@hi-spirits.com or see www.hi-spirits.com. Hogs Back Brewery has marked the start of the first harvest from its Hop Garden with a special event for customers, the local media, and beer writers. The Surrey brewer’s guests had the opportunity to see the entire process from picking fresh hops right through to enjoying a ‘green hopped’ pint of ale over a picnic lunch in the garden. The harvest includes the Farnham White Bine variety, a near-extinct hop once highly-prized by brewers for its aroma. Hogs Back Brewery is bringing the White Bine back to its home in the 250th anniversary year of its development by local hop farmer Mr Peckham Williams of nearby Badshot Lea. As well as picking some of the first hops from the 3.5 acre hop garden adjacent to the brewery, the group spent time at the nearby Hampton Estate, which will be drying the Hogs Back Brewery crop for use in its beers, including flagship ale TEA. As well as the Farnham White Bine, Hogs Back Brewery is also harvesting Fuggles, used in TEA, and Cascade, used in Hogstar English Lager. The brewery is expecting a crop of around 30 zentners or 1,500 kilos – enough for 25% of their annual beer production. 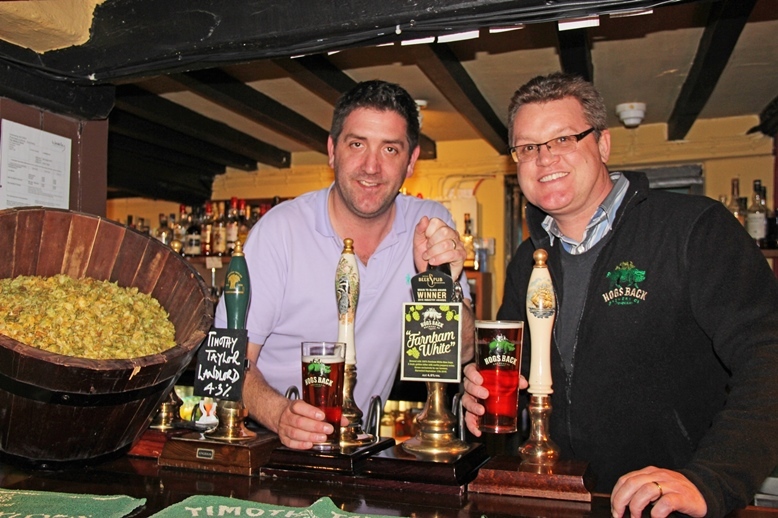 • Hogs Back Brewery was founded in 1992 in Tongham, Surrey, in the heart of the traditional Surrey hop growing area, and bought by current owner Rupert Thompson in 2011. • Its flagship brand TEA, or Traditional English Ale, is the leading independent ale in Surrey and increasing in popularity throughout London and the South East, as well as being sold in leading supermarkets. TEA was recently awarded the Gold medal in the Best Bitter Category for the London and South East Area by CAMRA, the Campaign for Real Ale. • The Hogs Back Brewery range includes a number of award-winning draught and bottled ales. Recent launches include Hogstar English Lager and Montezuma’s Chocolate Lager, both demonstrating Hogs Back Brewery’s ability to combine brewing expertise and tradition with product innovation to create distinctive, memorable beers. Hogstar won a Gold award at the Society of Independent Brewers’ National Keg Beer Competition 2015. Last year, Hogs Back also launched a traditional cloudy cider, Hazy Hog. • In 2014 Hogs Back Brewery planted its own hop field on land adjacent to the brewery, bringing the traditional but near-extinct Farnham White Bine hop variety back to its Surrey home. The number of Beer Sommeliers has reached the 100 milestone following a handful of recent accreditations by global beer education body the Beer Academy. Linda Sheehan of Barry Group in Ireland became the 100th Beer Sommelier after passing the final stage of the assessment at the Beer Academy offices in London earlier this month. Two other candidates, from the UK and Lithuania, successfully completed their Beer Academy accreditation on the same day. The Beer Sommelier accreditation is the ultimate qualification in beer knowledge. To succeed, candidates must first submit a written application including a portfolio demonstrating their work in promoting beer. If successful at this stage, they attend an assessment with Beer Academy director of training Alex Barlow, where they are questioned on their portfolio, before being asked to identify a number of beer styles and off flavours, and to recommend beer matches for a range of dishes. Jerry Avis, chief executive officer of the Institute of Brewing & Distilling, which operates the Beer Academy, said: ‘We are delighted to have reached the 100 mark on Beer Sommelier accreditations. Since launching the qualification in 2011, we have seen demand for it grow in tandem with the interest in beer and brewing both in the UK and abroad. Sheehan is currently International Trade Specialist & Exclusive Label Brand Ambassador for Alcohol with Barry Group, a leading independent retail and wholesale company with franchises including Carry Out specialist off-licences. She has worked in the food and drink industry internationally for 14 years. Sheehan said, “My love of beer guided me to the Beer Academy and I completed four of its training programmes before applying for Beer Sommelier accreditation.